This study shows a method to easily develop suitable impregnation procedure of chemicals for preserving the archaeological waterlogged wood (WW) using diffusion constant. The steady-state diffusion coefficients of polyethylene glycol 4000 (PEG4000), trehalose, and keratin through eight archaeological waterlogged wood species were obtained from the total amounts of the chemicals diffused through the wood samples. 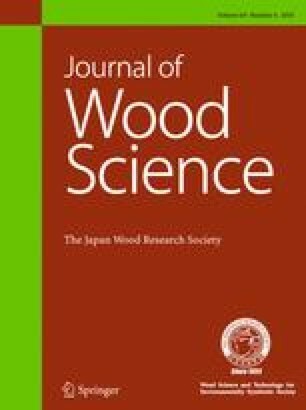 The diffusion coefficients were strongly affected by the anatomical structures of the wood species and degree of wood deterioration. Within the same species of wood, the highest diffusion rates were measured in the longitudinal direction, followed by those in the radial and tangential directions. The longitudinal diffusion coefficients were 1.5- to 8.1-times higher than the radial diffusion coefficients, which were in turn approximately 1.1- to 5.7-times higher than the tangential diffusion coefficients. The diffusion rates were found to be inversely proportional to the molecular weight of the diffusing chemical. The diffusivity of trehalose through the waterlogged woods was found to be higher than those of keratin and PEG4000. This study provides a potential method to easily estimate chemical diffusion coefficients for dip-diffusion treatments. The study was partly supported by Grants-in-Aid for Scientific Research (A) No. 25252033, Japan Society for the Promotion of Science, RISH Cooperative Research (database) and RISH Mission Research V, Kyoto University. The authors acknowledge the Thang Long-Hanoi Heritage Conservation Center, Hanoi, and the Institute of Archaeology, Vietnam Academy of Science and Technology for providing the archaeological wood materials.